Origin of modern man - Israel? Yogi Seal. And Orion and surrounding constellations. The god shown in the seal is “Proto-Shiva”. He wears the buffalo horns as his head gear, which is the characteristic emblem of Yama. He is also known as Mrigashira (Pasupathi) (Orion) and the lunar constellation is named after him. If you take a close look of that constellation in the sky map, the position of the tiger is tallying exactly the way it is represented in the seal. 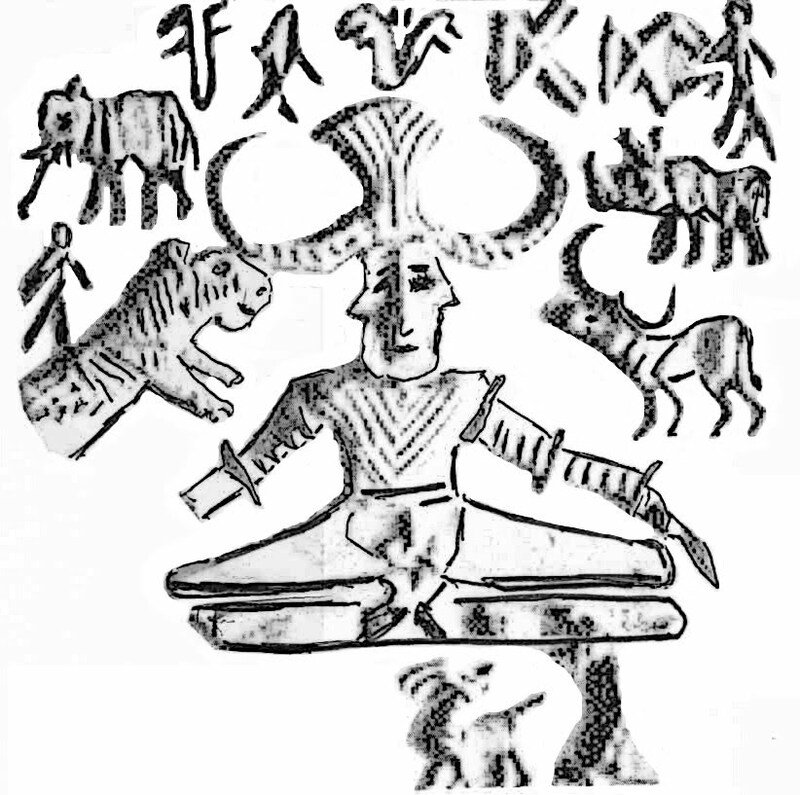 Other animals depicted in the seal had to be visualized with little bit difficulty, but all the animals are surrounding him, as depicted in the seal. Even minute points of the constellations are also depicted naturally in the seal. For example, there is a sign of man standing near the back of tiger, in fact there is a small constellation called puppies (modern name) (i.e. Little dog) only portion of which comes near to the back of the tiger is to be taken. It gives an appearance of little man standing over the back of the tiger as depicted in the seal. This little man symbol brings to my mind the idea of “Lord Ayyappan”. Note that the Yogi sitting position of “proto Shiva” is similar to the sitting posture of Ayyappan. Then refer to the childhood story of Ayyappan that he was sent into the forest by the step mother and came out of the forest riding a tiger. This story exactly tallies with the scene depicted in the seal. This story is evidence to the re-emergence theory of Indus ideas. It is a fantastic achievement that the constellations are so beautifully depicted, it cannot be done by ordinary minds. Definitely, it is the work of intelligent people. 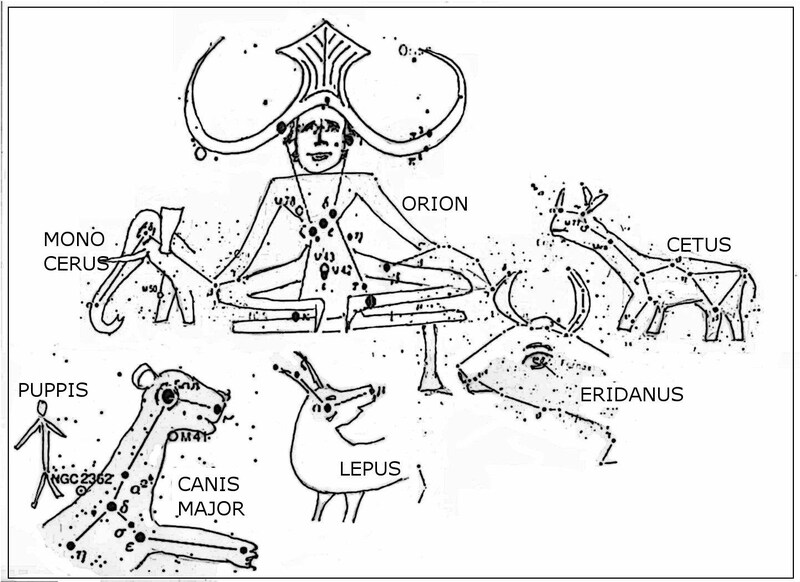 Proto-Shiva had been depicted with four faces, because he could see everything going on this world because of his top most position in the sky. He was god of moral value and punisher of immoral people, because he could watch all actions of people day and night on earth because of his position in high observation point in heaven and all seeing four/three heads. He can be identified with later day Shamash (Sumeria) and Brahma (of India). However Brahma is not popular in present day India, because he is really old time god and has been replaced by many other new upcoming gods. It is one important phenomenon to be remembered that in Hindu mythology one god is replaced by another god (because of conquest by new invader or ruler) and the new god is given all attributes of the old god, whom he replaced, these attributes are in addition to his already existing power attributes. Because of this replacement phenomenon Kalan and Brahma had been relegated to the back stage and Yama has taken over those powers, which he lost to Shiva in the subsequent period. Shiva reigns supreme as on today.